I have offered up info of the disappearance of Adji to a friend who has capabilities to stir up some Media. He has Media contacts and etc ...and does a broadcast internet show with others online. Great news Deenie! Thank you so much!! His name needs to roll off of people's tongues just as any other missing child does and SHOULD! Thank you Deenie! Praying Adji will be found. if you look at the main photo that is my friend Victor he is the Handsome Bald one. The man on the right is Mario Hemsley. I have known V for over 2 yrs. They broadcast on other sites and Youtube ... they are going to profile ADJI - this coming week. Mr. Mario if you do not recognize him - may be you would know his Father .. George Jefferson ... the infamous George ...The Jeffersons. I am trying Dolce ...trying and I know if Victor said he would make some things happen he will. He is a straight up Man, he would not say it if he didnt mean it. I told him about you and that you contacted Rev Jackson too. I feel Adji is still alive too. I think someone needed a darling baby and they took him. AWESOME DEENIE!!! Thank you so very very much!!! This is GREAT news! Please let your friend Victor know what a wonderful service they will be doing for this family!! As I had stated we went over to Immokalee yesterday after Mass, around 10am. It was not very busy at all, many people where out at church themselves, and the casino was not yet buzzing. We went by Adji's man-made memorial, my siblings placed their pictures for Adji down and around the area. My youngest sibling, he is 5, kept asking me to read to him what was written on the posters, as it was written in Haitian and he could not understand it. Unfortunately not being able to read it myself I had to explain to him that Adji was of a different culture. From the mouth of a 5 y/o he said "Oh, is that why he is gone?". I explained that it seemed the reason he was gone was due to a bad person snatching him up. My 9 y/o sister, who is extremely perceptive and loves to listen in on adult conversation, told my 5 y/o that since he was of a different culture (her words) "thats why no one looks for him any more". That was a sad and hard conversation to explain to them...and my father was not much help as he agreed that the prejudice society had given up on Adji. Sorry to babble on...but there is more! We went down into Farm Workers Village, my siblings had made cards and pictures for Adji's family, and my father wanted to deliver the items to them. We waited outside as to not overwhelm them all. My 5 y/o brother got to talking with some of the kids who were riding their bikes in circles up and down the street, so I walked over being curious. There was one kid who was talking for the group (there were 4 of them). His name was Jabraugn (sp?). He was very nice to me, and did not see me very threatening and spoke to me. I asked him if he knew Adji, he said yes. I asked him if he was playing with Adji the night he disapeared, he said no. I asked him if he had ideas of where Adji could be, and he said no. He went on to say though that many people within the neighborhood were very sad still and continued to look for Adji in the fields and woods around the neighborhood. He said that some believe he was taken, others do not. He then told me something interesting, when asking him if he ever goes up by the bridge and canal (which is up by the main highway) he said no, that is a big no-no in his house and he gets in trouble for getting near the road, BUT he did say that they all (all the kids) try and get as close as they can without getting in trouble, and that is a common thing that they all like to do when playing outside. If that is the case, I do not find it hard to believe that Adji was taken unseen by anyone. That main high way leads out of town and is a back road heavily traveled by truckers. Alright..sorry for the long post. I am done!! Dolce, I so hope Adji is found somehow someway, I too feel like someone took him, for I think if he was somewhere around his village he would have surely been found by now! I will continue to keep him in my prayers and hope he comes home soon! I Called for Help and My friends came to the rescue - Victor Allen, Mario Hemsley & Female co-host- * I wish I knew her name -"All and Each of them "- They made it happen - Victor is and has been my friend for some time. Broadcast from Pax Stereo - Mario is reading my letter I wrote to Mario Hemsley himself - for the Aid to Find ADJI - I added DOLCE's Witness and word. I am Bixa, Bix to Victor - who he references. Thank god that They made this Video and put this Broadcast out ! I am so thankful for their Efforts to make this happen. Thank you Victor if you read this. Pax Stereo has uncountable numbers of listeners - so I am so thankful. 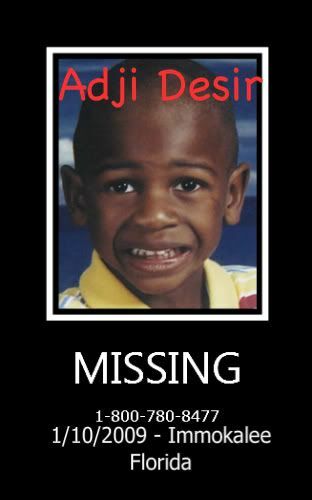 Lets Find ADJI and bring him home to his Momma and his Grandma - so He can rest and continue on with his life. We Need to Bring Adji Home - He is alive in our Hearts~ Precious Adji ~ I have faith he is out there and he is alive - He just has to be Found. He may not be able to speak, but his Spirit is Strong and in my Mind he is Alive. Thank you Deenie. Prayers for Adji's return. Soon! Thank you so very much Deenie. This has me in tears, happy tears! May the Lord bless and continue to keep Adji safe, return him to the loving arms of his family. Deenie, I'm so proud of you! You are a monkey who gets things done! Thank you for going above and beyond! dolce and deenie thank you for your hard work in helping to find Adji!! !my prayers are with the family,such a sweet little boy,please bring him home safe,and dennie you got some really great friends on your side,and i thank them too!! !god bless!!! Deenie and friends, Thank you! Dolce, thanks for your update on your Sunday visit. What a giving family you have! Prayers for Adji for his safe return. ADJI'S STORY TO AIR ON AMERICA'S MOST WANTED FEBRUARY 28TH! Watch if you can! Information, updates, photos, the family...you will see it all. This child is a precious gift and should not be forgotten. I look at his thread and I am heart broken, we have not made it to even half of a thread for this child, yet have gone through over 100 on Caylee and 2 or three for Haleigh. Not due to any fault of Monkeys, but due to lack of media attention and information. Dolce, thank you for showing your passion over Adji. yikes, I seem to be talking to myself today.. Thanks for the AMW reminder Dolce. I'll be watching and hoping the airing will bring in some much needed tips. Dolce - do you think an email drive by the Monkeys to NG and Greta on behalf of Adji, might stir up some response? Adji needs some exposure!! Page created in 2.185 seconds with 20 queries.